It's easy to let the number of Apple accessories you have build up and create clutter. From random cables to the occasional dead battery, a lone earbud (because you lost the companion when you were running) and who knows what else — it can be hard to figure out what you do need, especially when you can barely figure out what you have. Here's a way to put all that to rest: get this iPhone Accessory Bundle, and you can toss all your old accessories out. The bundle includes a wireless charger that supports all Qi-enabled wireless charging devices or devices with a Qi receiver (perfect if you have the most recent iPhone), a lightning charging cable (in case you still need it), and a set of truly wireless Bluetooth 4.2 powered earbuds. Breathe new life into your tech collection with this updated set of accessories — not only can you streamline down to the bare essentials, these gadgets feature definite upgrades to what you might currently own. The lightning cable offers a massive 10-feet of length, so you can enjoy the maximum level of flexibility when you charge your devices — and you can charge even more effortlessly with the wireless charger. Plus, who wouldn't want another set of wireless earbuds — especially when they come equipped with HD audio. 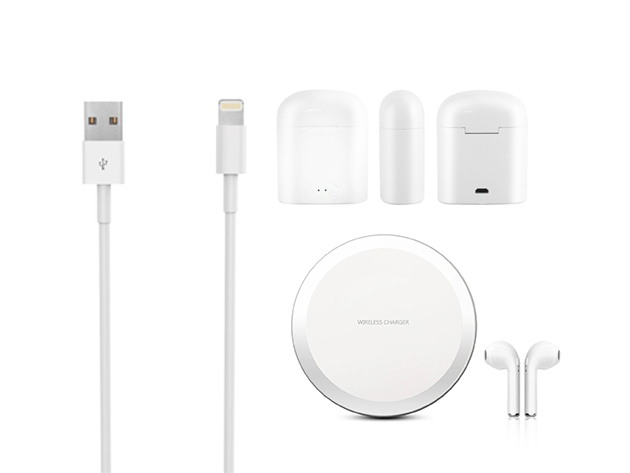 Usually, the iPhone Accessory Bundle is $129.99, but you can get it here for $34.99.